London Fashion Week, which finished yesterday, gave the industry a much publicised opportunity to market the striking clothes that form the Spring/Summer 2015 collections. This post looks beyond the catwalk, and beyond the “frow”, to describe the contribution of fashion to the UK economy. Although these figures only represent between 1% and 2% of the UK totals this is a significant industry and internationally, UK fashion cannot be ignored. London Fashion week is one of the ‘Big Four’ fashion weeks, alongside New York, Milan and Paris. However, the glamour of Fashion Week can distract from the fact that the value of the clothes manufacturing industry (not including retail) in the UK has been declining for many years. Employment fell by 19% between 2008 and 2012, compared to 1% fall in total employment. This is partly due to the recent recession which “substantially slowed the rate of wardrobe changes,” according to Oxford Economics. But there are more worrying long term trends to consider as well. 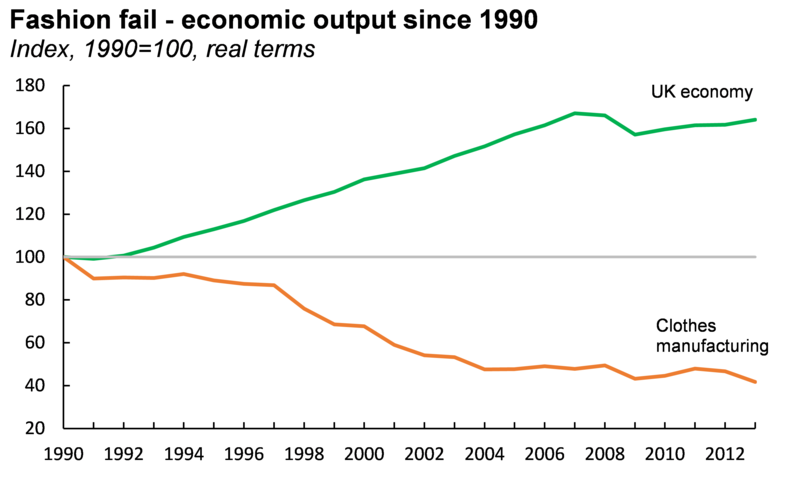 Between 1990 and 2013, the UK economy grew by 64% in real terms. Output from the clothes manufacturing industry declined by 58%, to £1.3 billion. Manufacturing bases in closer proximity to the source of raw materials, cheaper labour costs, and the growth of markets demanding production on a scale that the UK industry could not deliver, all contributed to clothes manufacturers moving abroad or, ahem, folding. To some extent, these factors can all be used to explain the decline of UK manufacturing in general. This suggests that the fashion industry could learn from another manufacturing sector which has been successful in recent years – vehicle production. The concept of ‘clusters’ has been shown to be highly advantageous to vehicle producers in the UK. Areas such as the West Midlands and the North East have attracted big investment from foreign firms, keen to tap into the concentration of skills and well established infrastructure in these areas. Similar concentrations already exist in the fashion industry, but encouraging these could bring noticeable rewards. Brands such as Rolls-Royce, Bentley and Aston Martin (although subsidiaries of foreign owned companies) are by-words for luxury and the desirability of UK-made goods. This reputation has enabled the car industry to focus on the high-value export market, where the higher labour costs of the UK are seen as an advantage indicating the higher skills of the workforce and promising better quality products. The UK fashion industry has an opportunity to exploit a similar reputation and re-build its fortunes in the coming years. *This article uses data from the ONS. Alternative estimates of the economic contribution of the industry are produced by Oxford Economics and published by the British Fashion Council. Data on the retail and manufacturing industry’s economic output, employment, turnover and businesses come from the ONS, Annual Business Survey, 2012. The industry has been defined to include the manufacture of wearing apparel (SIC07 code 14), the wholesale of clothing and footwear (46.42) and the retail of clothing in specialised stores (47.71). The time series data is from the ONS Quarterly National Accounts, Q1 2014, Low Level Aggregates Table. ONS series: KLA8 (whole economy GVA), KL5K (manufacture of wearing apparel), KL6D (vehicle production). Economic output is Gross Value Added (GVA). Oxford Economics, Sector Overview: Textiles and clothing, Spring 2014, has also been used. Oxford Economics data were also used in the British Fashion Council’s report, The value of the UK fashion industry, 2010. ← Previous From brick walls to international energy systems: are academics any use?